For Alan and Susan Reed however, their commute to work was becoming increasingly longer as they racked up air miles from their home in Ponteland to Rome, Florence, Umbria and seemingly everywhere in between. Sipping espressos en-route to pick up their hire car and head off (quite literally) into the hills of Italy’s unspoiled countryside became the norm for internationally-successful artist Alan Reed and his business partner and wife Susan. Thanks to the success of Alan’s unique watercolours of various Italian locations and landmarks (referred to fondly as The Italian Collection), Alan jetted to Italy at least twice a year to gather research for commissions and new paintings to add to the collection with his tried and trusted collection of handmade Italian sketchbooks on hand to gather reference. The autumn of 2007 saw Alan return to Italy with wife Susan to gain reference for a number of commissions he had been contacted about. Flying to Pisa in the October of 2007, Alan and Susan picked up their hire car and headed to Chiesa Pagano – a beautiful hilltop villa nestled in the Umbrian valley. As far as business trips go, Alan and Susan certainly made the most of theirs – sampling the fresh, local cuisine served in nearby restaurant agriturismo Calagrana – a 19th century farmhouse serving “lost dishes” of traditional Umbrian cuisine and comforting classics such as asparagus served with poached egg and drizzled with white truffle oil, or baby goat with seasonal vegetables and fresh tagliatelle. Next stop on their trip was the Niccone Valley, a lush green hilly area dotted with restored private farmhouses, luxury villas and apartments where Alan sketched the incredible home of an interior designer. 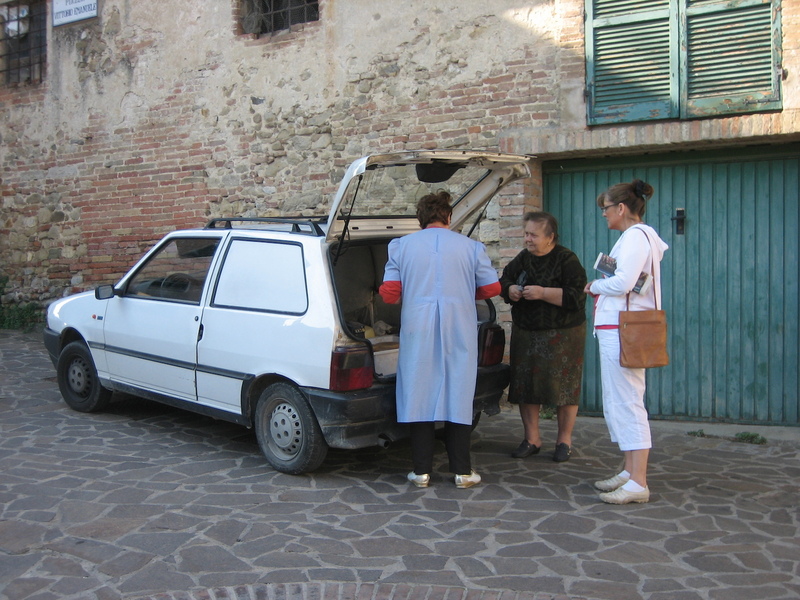 With one more appointment to make on this week-long trip, Alan and Susan headed to the medieval town of Panicale which overlooks Lake Trasimeno on the border of Umbria and Tuscany. They were here to meet a gentleman called Michael Box to discuss a commission of his home which nestled in the grounds of a large olive grove. Alan and Susan had booked to stay at the historic Villa LeMura and arranged to meet Michael and his family at nearby Albergo Ristorante Masolino. Run by two brothers – one with a penchant for wine and the other desserts – Alan and Susan enjoyed a wonderful meal here before taking a trip to The Abbey of Sant’ Antimo, a beautiful Romanesque church, in a picture-perfect setting just south of Montalcino in southern Tuscany to gather reference for another commission, this time of the church. Fast forward a year and Alan and Susan were off again, this time to Papiano, a tiny village tucked away in the Province of Perugia to stay with Ian and Barbara Harrison whom had invited them to see their holiday home in the hope that Alan could paint it for them. The couple still vividly remember how quickly they slipped into the local way of life – sipping espressos at the coffee bar across the street in the warm autumn sun, or buying cheese and fresh vegetables from the piazza as they chatted to the locals. As Alan headed off to paint on-location, Susan thoroughly enjoyed immersing herself in the Italian way of life, cooking typical Italian dishes from scratch just like she had in her twenties with dear old friend Nai while living in Venice. After two days at Ian and Barbara’s beautiful apartment in Papiano, Alan and Susan made a beeline for one of their favourite hotels – the Relais il Canalicchio whilst in the area to say hello. One of the unexpectedly lovely bonuses of being invited to Italy for commissions of particular landmarks or locations meant Alan and Susan were able to broaden their knowledge of Italy’s tourist-dense areas, but also the more suburban areas and uncover authentic hidden gems and beauty spots. Unknown to them at the time, this “local knowledge” would come in exceptionally handy when the couple launched their Reedart Painting Holidays in Italy some years later. Fortune favoured Alan and Susan that day, and as luck would have it the hotel had a fantastic deal on offer, so they made the spontaneous decision to stay for a few extra days here instead of heading elsewhere to meet up with Alan’s old school friends David and Val. Naturally Alan and Susan loved showing David and Val the sights – stopping by Casa San Gabriel in Umbria to introduce them to owners Chrissie and David whom they had become very close to and driving to some of their favourite nearby hilltop towns for a leisurely lunch, glass of wine at a bustling wine bar or fabulous evening meal. Both trips were not only productive in terms of helping Alan gain new reference to grow his Italian Collection of paintings and seek inspiration for his commissions but also wonderfully fruitful for both Alan and Susan in terms of relaxation and exploring new places off Italy’s well trodden tourist track. 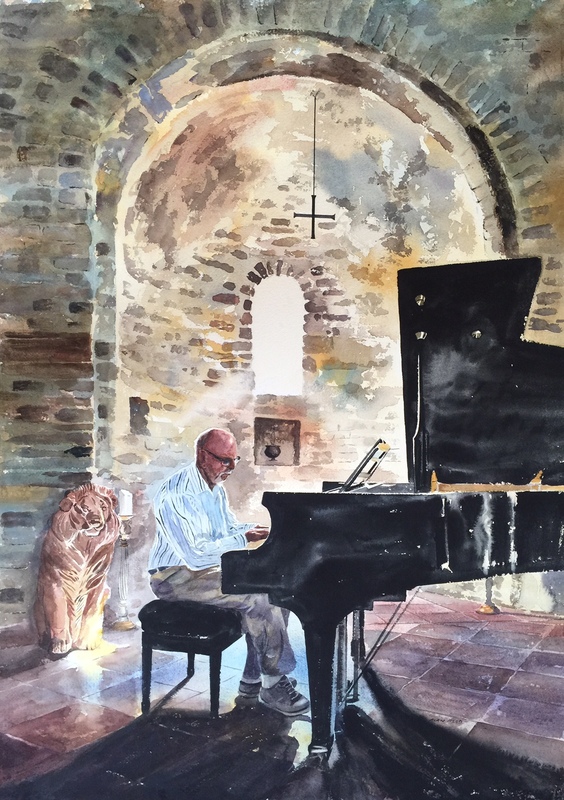 After the resounding success of the first Reedart Painting Holiday in Umbria, Italy in early 2006; Alan and Susan found themselves back in the region just a few months later in search of reference for a commission Alan had been contacted about. It was also an exciting opportunity for Alan and Susan to return to their beloved Italy and spend a week eating, drinking, exploring and sketching. Their starting point was Umbria, where Alan would sketch the beautiful Casa Panfili owned by Alastair and Betty Stuart. After one night here the couple moved on to San Quirico d’Orcia in the Province of Siena, Tuscany to meet up with their friends Karen and Jonathan Marks. The group were staying in the Hotel Relais Palazzo del Capitano, a stunning boutique hotel set in a 15th century mansion, and spent the next two days eating, drinking and exploring the distinctive hilltop towns of Pienza, Siena and Montalcino. Foodies Alan and Susan thoroughly enjoyed the local cuisine, sampling everything from antipasti and steak to fresh white truffle pasta. After a long day of exploring the various hilltop towns in the area, Alan and Susan headed straight for the tranquil gardens at their hotel, the Hotel Relais Palazzo del Capitano in San Quirico d’Orcia to relax. This trip was a perfect opportunity for Alan to sketch some of Tuscany’s unspoilt countryside and became a popular new addition to his burgeoning Italian Collection at the time. The next stop on their week-long trip was to Colle di Val d’Elsa in the province of Siena, Tuscany. Alan’s brother had worked at local Michelin star restaurant Arnolfo for a summer in 1992 and the group decided to drop by to introduce themselves. Despite not feeling quite as dressed for the occasion as they hoped, the group were warmly welcomed and treated to an unforgettable Michelin star meal at the restaurant. The last stop on this particular trip was to Lucca, a picturesque city which lies alongside the Serchio River in Italy’s Tuscany region. Renowned for its impressively preserved city walls which date back to the Renaissance era, the group couldn’t resist taking part in a popular tourist pastime of cycling around the city walls which overlook the historic city, cobbled streets and beautiful tree-lined paths. Another wonderful trip exploring more of Italy’s tourism and hidden treasures, Alan and Susan returned home to their gallery in Ponteland. After a busy year travelling to and from Italy in 2006, Alan and Susan did not return to Italy until May 2007. This time, it was for a very special occasion! A studio painting of Susan by Alan Reed inspired by the Sargent exhibition. The couple were jetting to Venice with their friends John and Liz Wilthew their friends from church who were celebrating a rather special wedding anniversary. Having never visited Venice before, John and Liz were certainly in good hands with Alan and Susan as tour guides. As it was a special occasion, the group stayed at La Calcina Guest House – also known as Ruskin’s House – which boasts beautiful views of Venice and a superb terrace on the water. A visit to the Il Mercante Veneziano resulted in a beautiful hand-crafted leather sketchbook which Alan had made for his wife Susan. Every page, to this date contains a painting based on a memorable event or trip from when they met in 1990 to 2007.